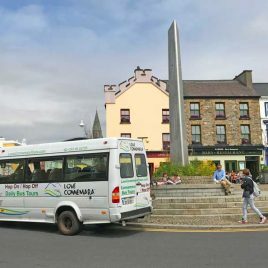 Love Connemara Tours provides guided tours of the Connemara region on our flexible hop-on hop-off daily bus tours. With scheduled routes to choose from, you can explore and experience the beautiful scenery of Connemara whilst listening to recorded commentary of in-depth local knowledge. Many of Connemara’s visitor highlights are covered on the routes such as Kylemore Abbey & Victorian Garden, Connemara National Park, Clifden town, Derrigimlagh Discovery Point, Cleggan (including Inishbofin ferry departure point), Inagh Valley, The Sky Road, Padraig Pearse’s Cottage and Interpretive Centre, to name just a few.